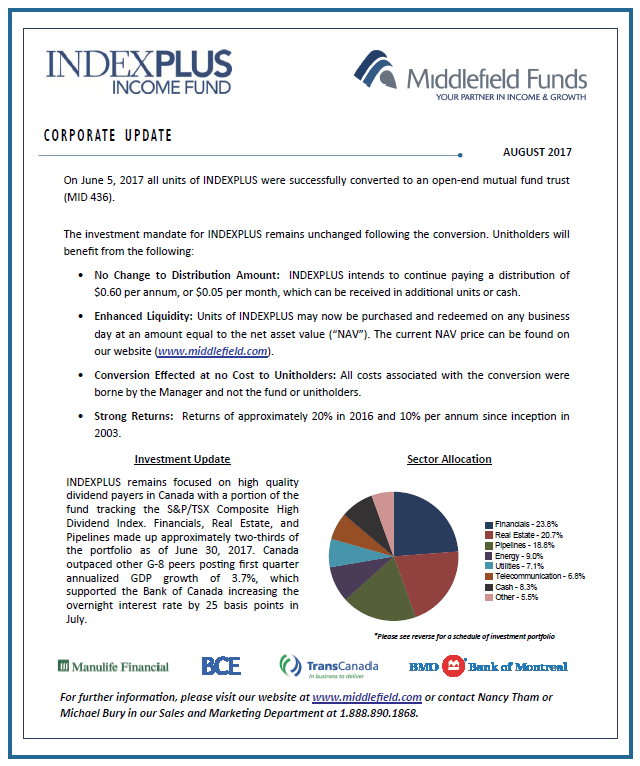 INDEXPLUS Income Fund invests in a diversified portfolio of equity income securities of which a portion tracks the S&P/TSX Composite High Dividend Index. The remainder of the portfolio is actively managed to enhance returns and reduce the risks associated with indexing, while maintaining low-cost exposure to the underlying equity income market. The S&P/TSX Composite High Dividend Index is a strategy index consisting of 50 to 75 stocks selected from the S&P/TSX Composite Index focusing on dividend income. The index is market-capitalization weighted, with stocks capped at 5% and each sector capped at 30%. The index rebalances quarterly on the same schedule as the S&P/TSX Composite Index. The Fund is authorized to issue series of units designated as Series A or Series F.